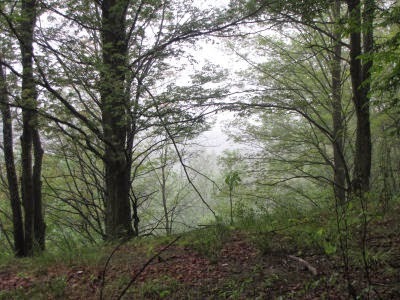 It was a rainy, rainy, foggy day, which made the open spaces mystical. The botanical offerings were outstanding, as you will see. If we had to be wet, at least it was great to find such wonderful things. I find yellow lady slipper orchid regularly Cypripedium calceolus, but I liked how this group looks hiding in the fluffy horsetail. 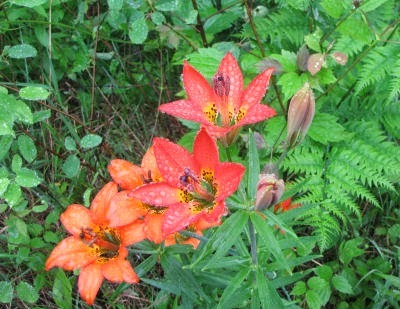 Another big surprise was the wood lily Lilium philadelphicum. We have seen lots of it in North Dakota but there it was short- about one foot high. I've never seen it in Michigan before, but it was growing in lots of places, and tall- two to three feet. It's the only wild, spotted lily that faces upward. And then... I thought I had gone straight to Nirvana! I have NEVER seen this orchid before. 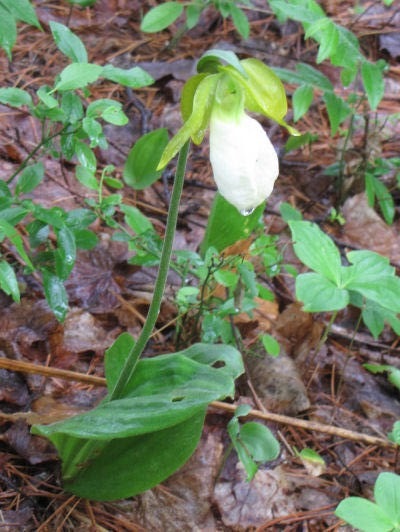 It's the largest of the northern orchids, showy lady's slipper, Cypripedium reginae. And we saw them everywhere! They were growing in all the special, rich boggy places you would expect, but even in the roadside ditches like weeds! We could hardly believe how many we saw. It's about two feet tall, and the leaves and stems are hairy. Want to see it closer? OK. There is so much to show you from this day that I think I will break it up and come back tomorrow, rather than post so many pictures that you skip them. The trail was well-cleared and marked, so the only real problem was that we were SOAKING wet. Yesterday was just too topsy-turvy to get a post up. I got up at 3 am to do the paper route. It was Marie's last day here, and she got up too, and went with me. When we got home we decided to deal with all the recycling stuff that has been waiting for months for be sorted and delivered. We did three car loads and made a real dent in the piles in the shed. But at last Marie had to leave. I know we've been together for a month, but I think she's the one person that I could live with and never want to be away from. We really seem to be like adjacent pieces of a jigsaw puzzle that just seem to fit. I think she found one way to make the parting less painful. By then I was so sleepy that I could hardly stand up, and just sort of fell onto the couch after she left. I'm glad she was only driving a couple of hours that afternoon, since she hadn't had much more sleep than I did! Even though I'll be home for the next month, I will take you through the last hike, day by day. Several people enjoyed that last time. If something stupendous happens at home, I can always break into the "story." So, on June 15 we hiked into the Jordan River Valley Pathway. Of course, that's the one in northern Michigan! 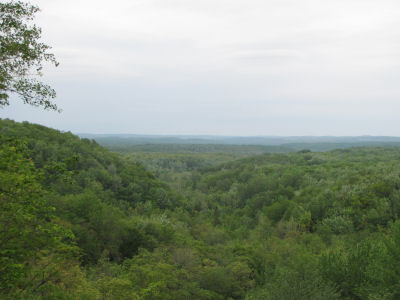 There are two major overlook spots, and this is the view from the one near the south end, called Landslide Lookout. 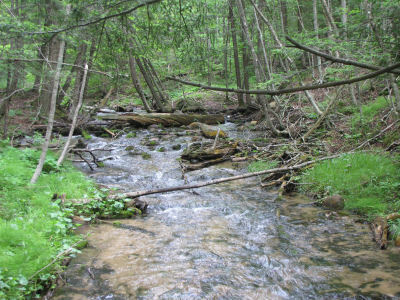 The JRV is all in the Mackinac State Forest, and is preserved for hiking. You can only even camp at one location. This hike would not have been impossible to backpack, but the planning would have been more difficult, so we ended up base camping and walking each day as a day hike. It was just too rushed to get all that figured out between the two hikes. Just after leaving the overlook, the trail headed down into the valley on beautifully benched trail. This picture is actually the trail on the opposite side of a gully, but we were standing on trail just like it. I saw a new plant, or a different stage in the life of a known plant almost every day. 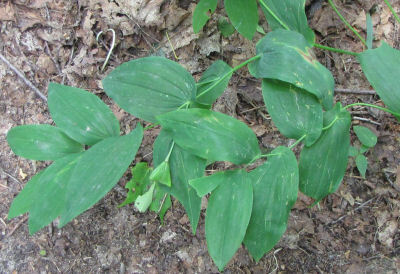 The one for this day was the seeds of Large-flowered Bellwort. See how the stem seems to grow through the leaves? 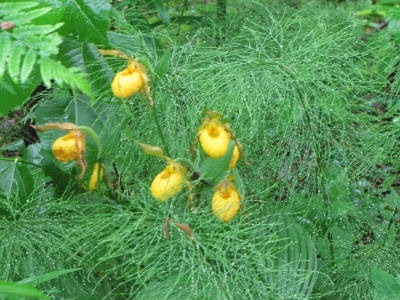 There's another bellwort that does that too, but it doesn't grow in Michigan. The seed case is that triangular "bead" near the middle of the picture. The Jordan River winds through the valley, and here the trail crosses it on Pinney Bridge. It is not navigable within the section which contains the Jordan River Pathway. The area is also closed to bicycle use, so hikers can have a great experience. The one drawback is that there is only one allowed campsite. 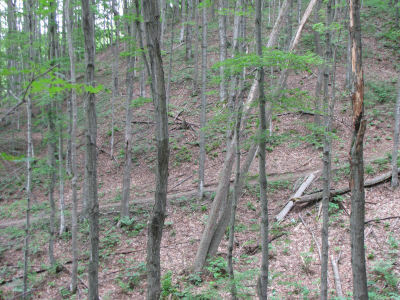 In most Michigan State Forests, dispersed camping is allowed. This restriction makes a thru-hike difficult. Since we were day-hiking, we camped instead at Graves Crossing... a State Forest Campground covered in poison ivy. We were very, very careful! Although there were some days with annoying mosquitoes, the bugs weren't nearly so bad as on the UP hike. Marie wore her head net a few days, but I never did, and we actually sat outside the tent for a while some evenings! Home Again... Same or Different? We are back at my house. Yes, all but three miles of the NCT (which I'm saving for the August celebration) have passed beneath my feet. We finished at the Lower Peninsula end of the Mackinac Bridge (Michigan). My total will be about 4390 miles (have to change some numbers in my spreadsheet to get the exact figure). Oddly enough, I don't feel much of anything. The last day was just one more walk like all the rest. We did this entire section as day hikes with a car at each end of the day. We walked to the car, got some lunch, did some sightseeing, and went back to the house of the friends where we were staying. It is very strange. I guess that I can't get my head around the idea that it's basically over. Of course I will keep hiking, but after the August shindig there just won't be any more big yearly trips to explore some new piece of this trail. I have ideas for places to hike, and ideas for more ways to support and promote the North Country Trail, but for 20 years my summers have been defined by where my new NCT hike was going to be. Now that will be changed. I don't know just what to do with this reality yet. Just a little junco. Not unusual at all, except perhaps its behavior. It was totally unconcerned about how close we were. It was hopping along beside the trail, and we walked within six feet of it before it fluttered a bit farther away. We should be home tomorrow, so perhaps I'll have a live post. We are doing this hike on a very tight schedule because I have to do the paper route beginning the very next morning. I'll pop in and say a quick hi, even if I can't manage a great post. Pyrola elliptica, Shinleaf, is a wintergreen relative. It has waxy, white flowers, shaped like little upside-down cups. But it was only in bud last week. It's not particularly rare, but it likes nice rich forest soil, so you don't run across it very often. Who knows, maybe I'll be able to catch a shot of the open flowers on the next hike. Here's another family scene. I really like this one. 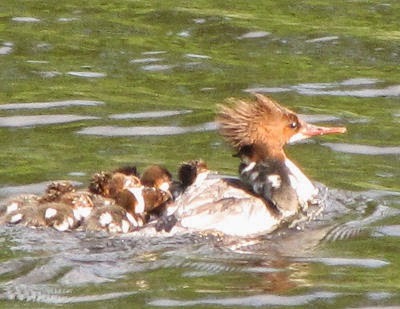 It's a female merganser and a whole passel of babies, swimming on the Tahquamenon River. I especially like that I caught one of the babies riding on mama's back. And mama's crest is just raised so high that it looks like a really moussed punk haircut! Just one picture here, but it's very special! 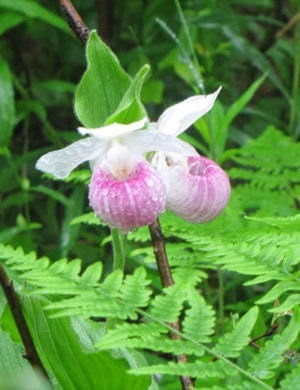 This is a pink Lady's Slipper. Yes, it is! But it's albino. How cool is that? First one I've ever seen, although I've found pictures of a few on line. 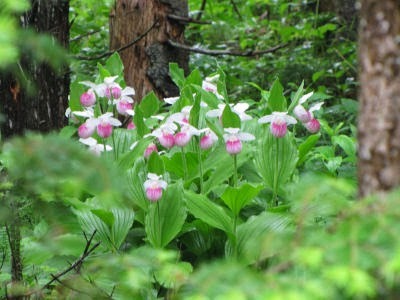 We were actually done hiking, and driving toward St. Ignace in the car. 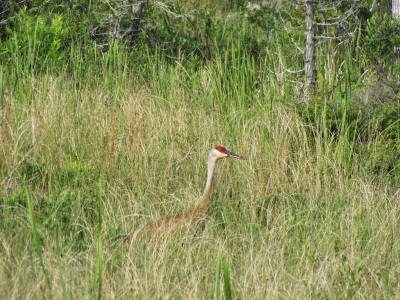 A sandhill crane with two babies in tow ran across the road. Some babies! 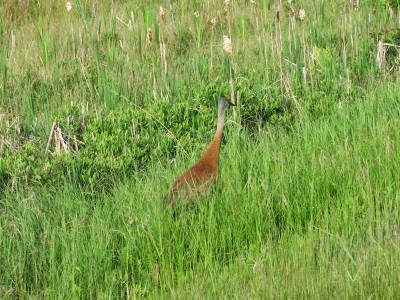 They were the size of turkeys, but mama was much larger yet. I had to stop and try for some pictures. This is one of the babies. They hunkered down in the grass, and only popped their heads up occasionally. I thought that I had missed any chance to get any good pictures. Mama seemed to be quickly moving away from the road, and from me. Then, then... she turned and walked back toward me, perhaps feeling threatened. I backed off a bit, but I was armed with a zoom lens! Dragonflies are always really cool, and a couple of them held still to have their pictures taken. I'm really sure of the ID on this one. It's called a Chalk-fronted Corporal. My dragonfly ID consists of looking at pictures in a book, but this one is pretty common. Sorry for the non-natural background, but it liked our bag. What can I say? This one's identity I'm less sure of, but it seems right. This is called a Blue Dasber, but this is an immature male, so it's still brown. I got several nice pics of him as he perched on a weed near the pond of July 5. That all sounds right as the book says it perches on shrubs and vegetation beside ponds. I sure think they are beautiful! We awoke to gray skies and very damp clothes (always a lot of fun to put on... not). But even though the mist was still thick over Culhane Lake when we left, the day promised to be dry. It was clearing as we reached the suspension foot bridge over the mouth of the Two Hearted River, another very impressive structure. Soon we were enjoying blue sky over the Lake Superior Beach. It was a beautiful setting for our last trail lunch of this hike. Tomorrow and beyond, until I'm home again... highlights of some special finds. It started raining in the night again, and we awoke with a cold, misty rain blowing. Most of the day we alternately crossed small hills and bogs. 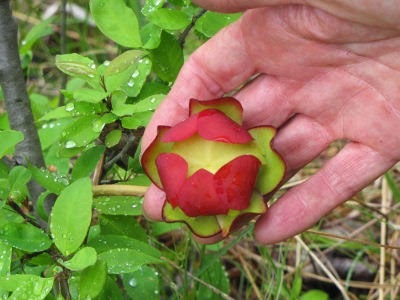 Bogs are special, acid wetlands where specific types of plants are found. Today we enjoyed the pitcher plants. Insects crawl down those big tubes to get water which has settled in the bottom. But downward pointing hairs prevent them from escaping, and the plants then digest the insects. They were in full bloom! I've seen them blooming before, but often in the wild the colors aren't all as vibrant as the ones we saw. 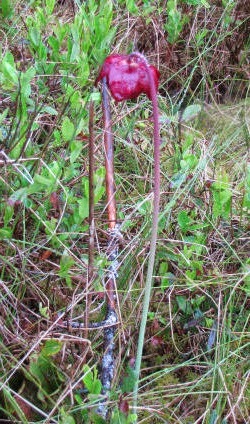 The tubes can vary from green to the deep red shown here, and the flowers are red to purple-ish, with tones of green too. The stems are quite stiff, and you'll never see the view below unless you turn a flower up to look at the other side. By late afternoon we were completely dried out when a thunderstorm blew up! So we walked into camp at Culhane Lake completely soaked again. We set the tent up as fast as possible, threw our wet packs and selves inside, and tried to sort it all out in a cramped space. It did stop raining before nightfall, so we hung the wet clothes outside, and were actually able to cook a dinner. We had a short walking day today to give us plenty of time to fool around and see all of the Tahquemenon Falls. (It rhymes with phenomonon.) There are five lower falls (both lower down the river and lower in height), and the upper falls. First we came to the lower ones. Here is a closeup of one of the lower falls. The upper falls is considered the second largest falls in the US, based on width, height and water flow. Of course Niagara is first. You used to be allowed to go much closer to the falls, but now the viewing is restricted to platforms which keep you at a distance, which makes it seem smaller. This is a special place to me. Hubby and I honeymooned here 42 years ago, and I've been back several times. I almost decided to make it the location to complete my NCT hike, but it seemed too far from home for friends to easily join me. We were glad we filled every water container before we left the park, even though it meant extra weight, because we camped that night in a poor location in sight of a small lake we could not access for water. But we were content with the memories of the falls and a short walking day. I think we were dry all day on the 7th! We walked between the Rivermouth and Lower Falls Campgrounds at Tahquamenon. This was our longest day. Their sign says 11.7 miles, but the maps really indicate that it's more like 14 miles. 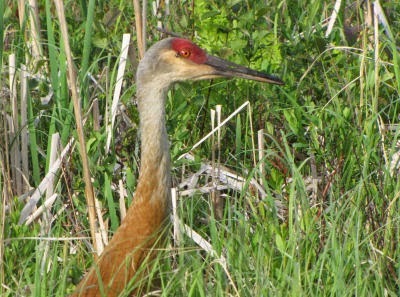 We were "serenaded" (more like kept awake) by sandhill cranes at night. I thought I was getting a picture of one in the morning, but by then the cranes had left, and what I got a picture of is a great blue heron. Still, very nice. The day began by crossing the mouth of the Tahquamenon River on the road bridge. One lovely morning! Then we followed a dirt road for a while before popping back into the woods. The roads were often lined with patched of Canada anemone. The rest of the day was over small hills and through woods. There were several small lakes that were beautiful to view, although pictures aren't too scenic, as the woods prevented open views of the water. It's always curious how wonderful and restful a view can be in person but a picture is just a slash of blue in dappled shade through a bunch of trees. Here I am, standing in a typical patch of woods for the day. By late afternoon we reached the Riverbend Campground of the state park, another beautiful location. With a picnic table again, we sat down to a "fancy" dinner. Hey... a table and bench can be a really nice perk! This is beef-barley stew with dumplings.